has already begun to turn a bit bitter. The fall and winter months are a natural match for everything warm, comforting, and cozy. 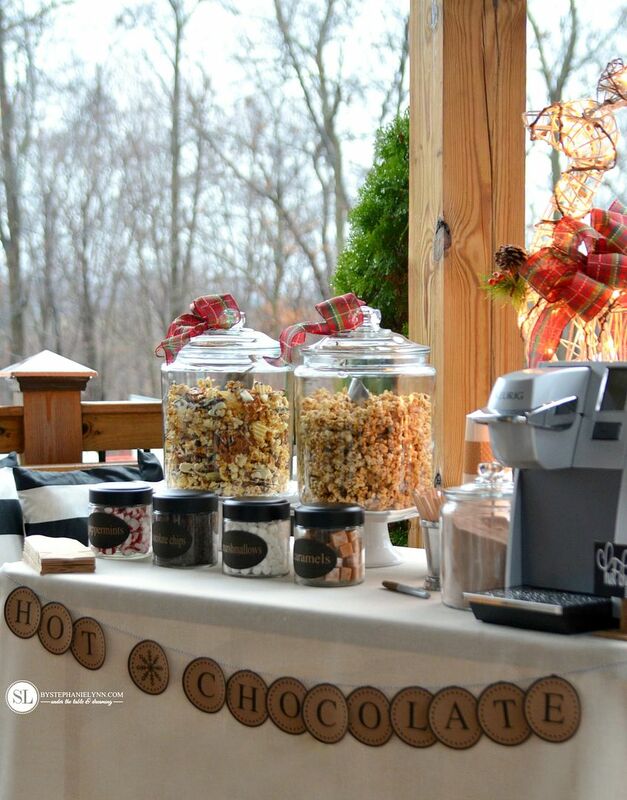 Whether we are enjoying the festive outdoor activities of the season, or welcoming guests coming in from the cold, a Hot Chocolate Bar has become an essential part of all our holiday entertaining affairs. I’m a huge fan of self-serve party bars, especially this time of the year. Once the prep work is done, the tables practically run maintenance free – leaving the host more time to mingle and enjoy the festivities. 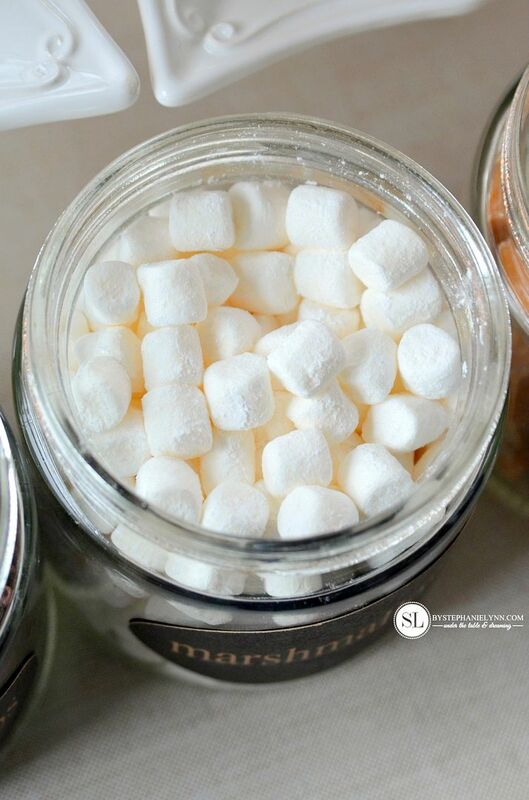 Plus, our guests have always loved the idea of being able to mix up their own custom concoctions. 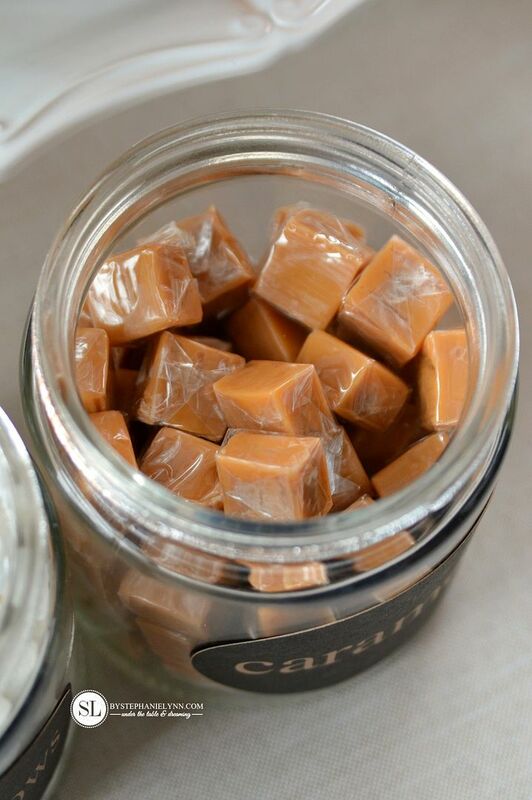 along with two fabulous caramel popcorn recipes. 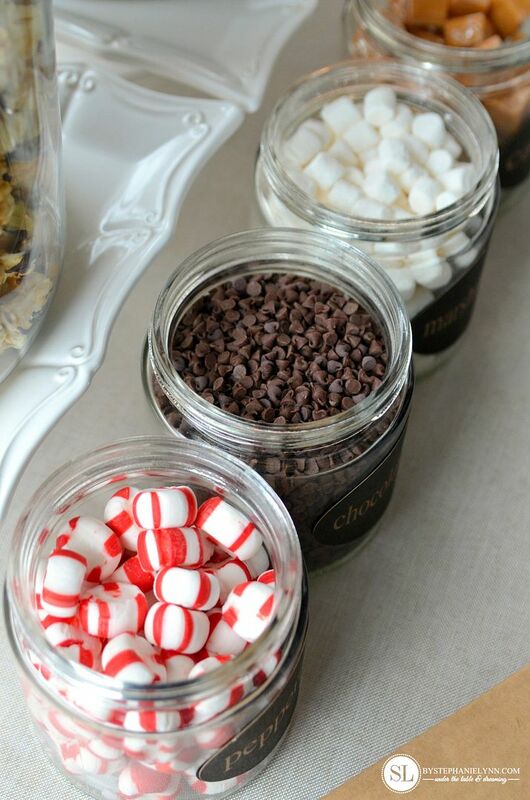 to help you get started on creating your own Hot Chocolate Bar for the upcoming season. 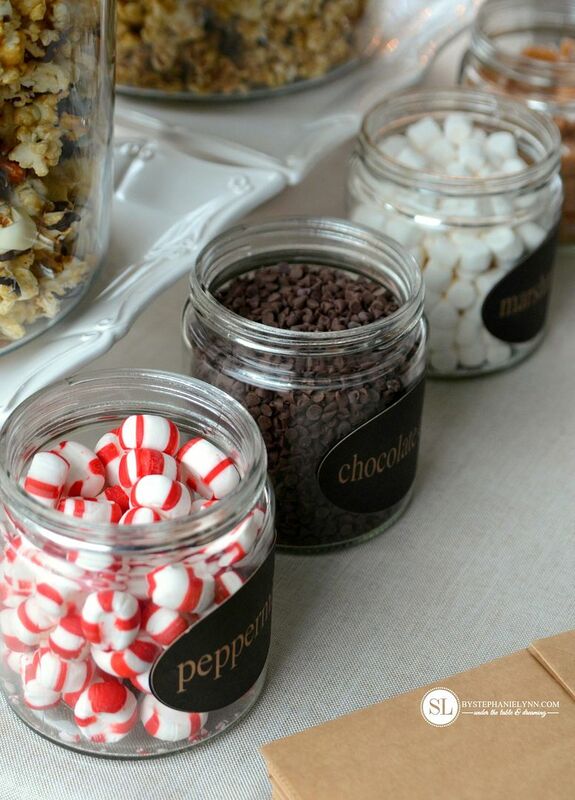 Glass jars and containers are some of my favorite things to have on hand for entertaining displays. 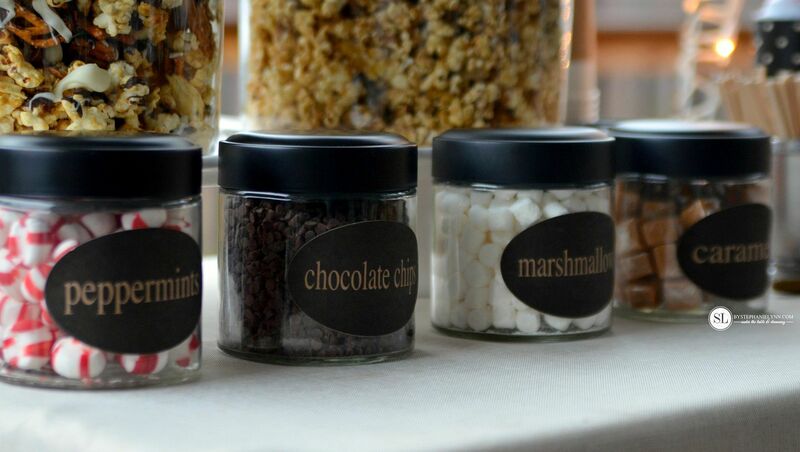 I picked up these little chalkboard label glass jars to hold all of the toppings. 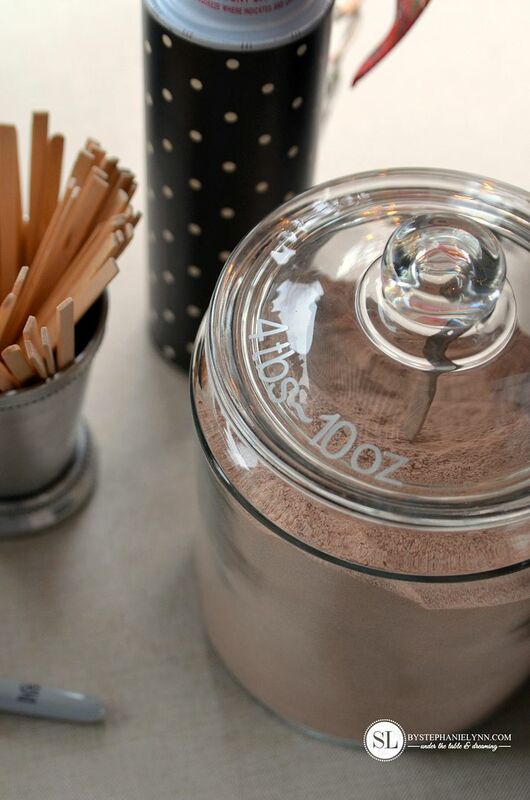 to go right over the chalkboard ovals on the jars. The free printables can be found at the bottom of the post. 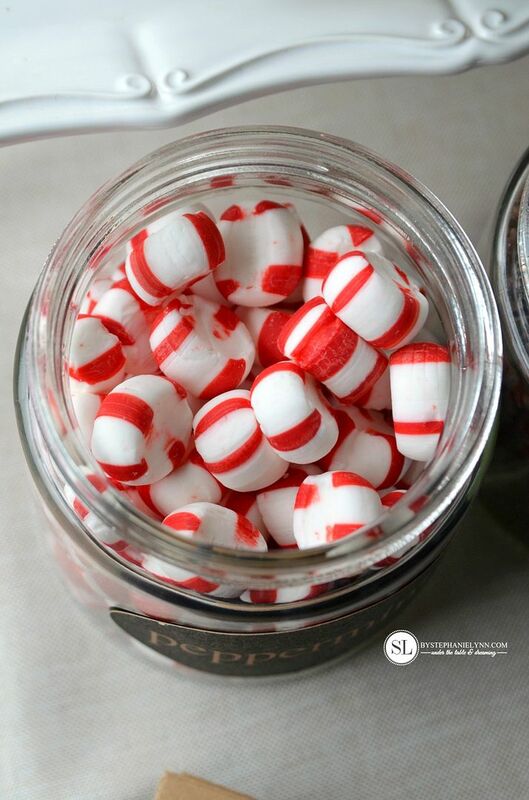 old fashioned peppermint puffs, mini chocolate chips, mini marshmallows, and caramels. 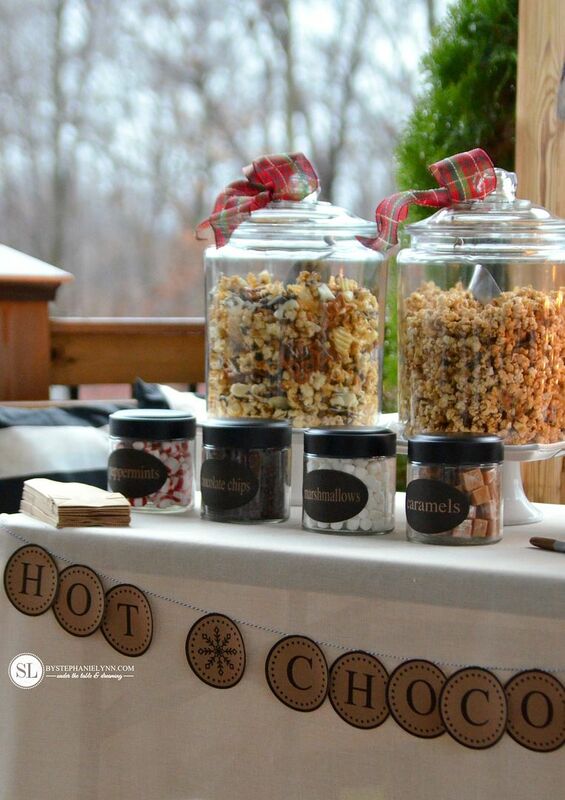 Winter activities held outdoors always call for some accompanying snacks. 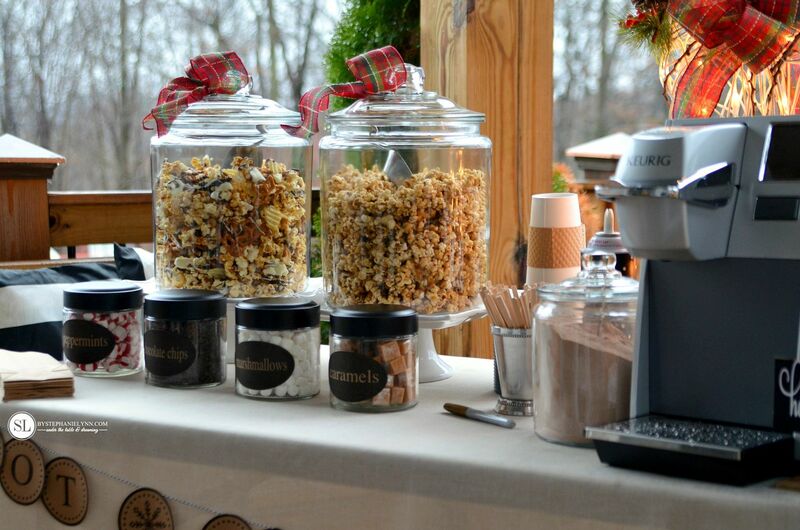 We made two double batches of homemade caramel popcorn to fit the bill. 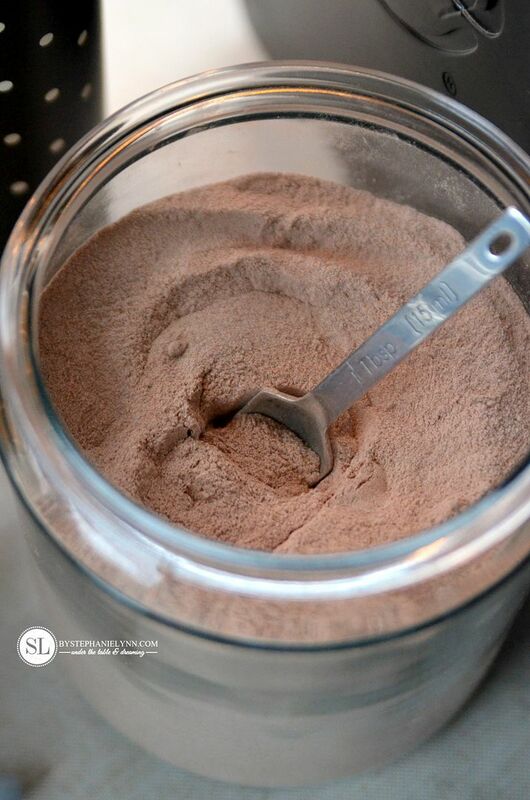 Both recipes are incredibly simple to make…and easier to eat! The recipes can be found at the bottom of this post. The holiday shaped pretzels are just the cutest and so fitting! 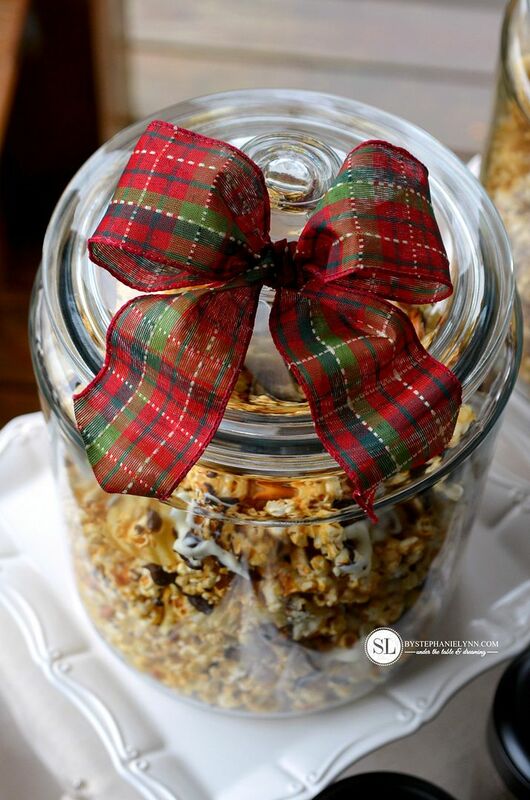 Plaid bows were added to the jars for a festive touch. 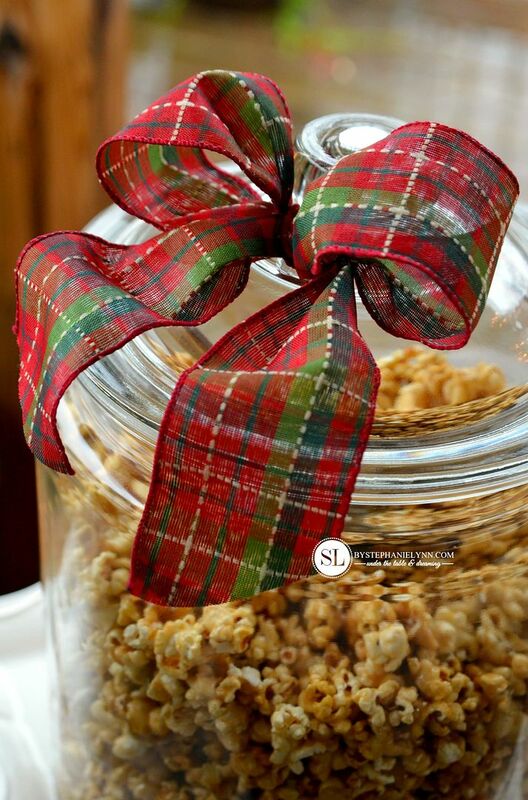 The bows were simply tied with plaid wire ribbon and hot glued to tops of the glass jars. The hot glue peels right off the glass when you’re done. draped with some coordinating plaid ribbon. when not attending the Hot Chocolate Bar. 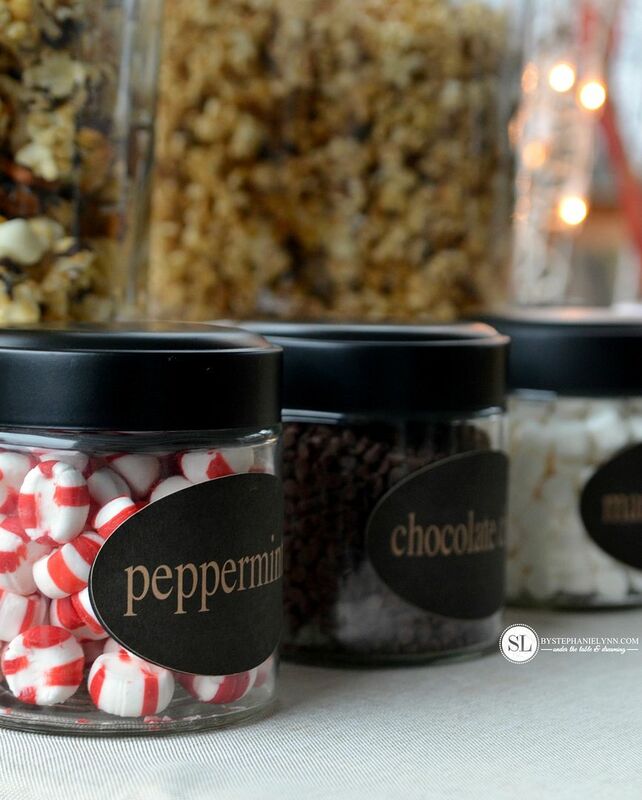 – for guests to label their cups. 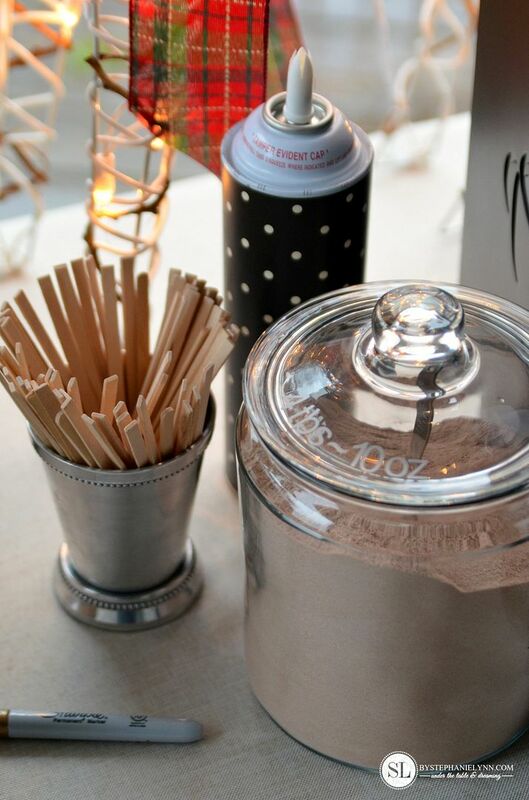 And don’t forget to dress up that can of whipped cream with a piece of decorative scrapbook paper. 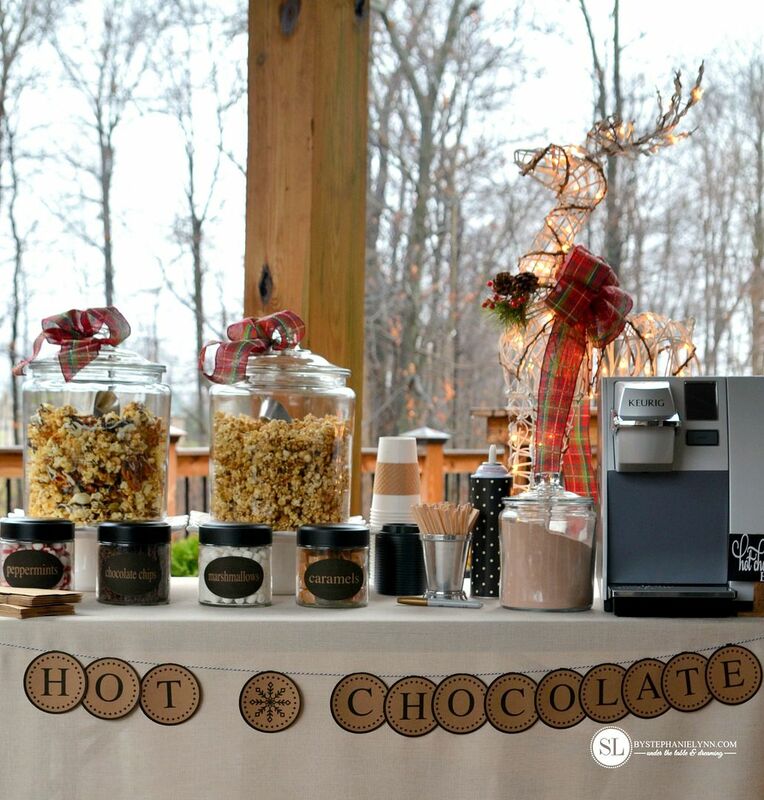 While setting up the Hot Chocolate Bar it’s a good idea to make a note of the cup sizes being used and the amount of chocolate mix that should be added. Be sure to display these numbers somewhere on the table, easily visible for your guests. 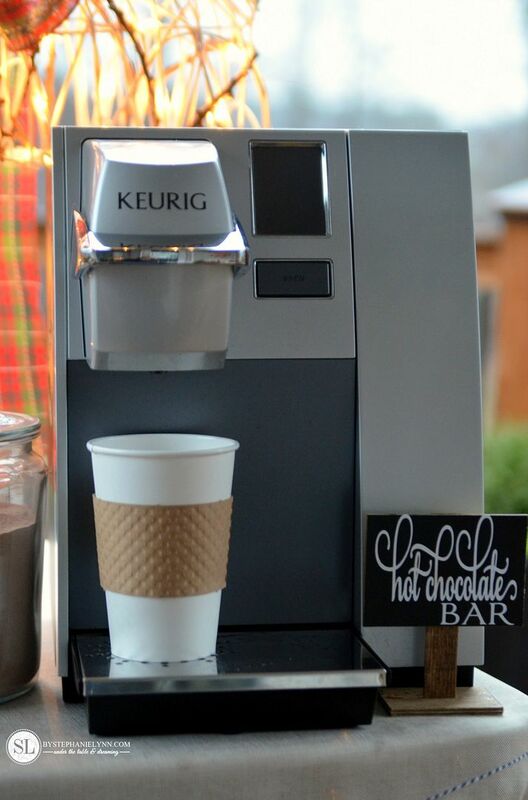 For a constant supply of hot water we love using our Keurig. without the k-cup, so the only thing coming out of the machine is hot water. It’s quick, super simple and perfect for a crowd. crackling fires and some hot chocolate? 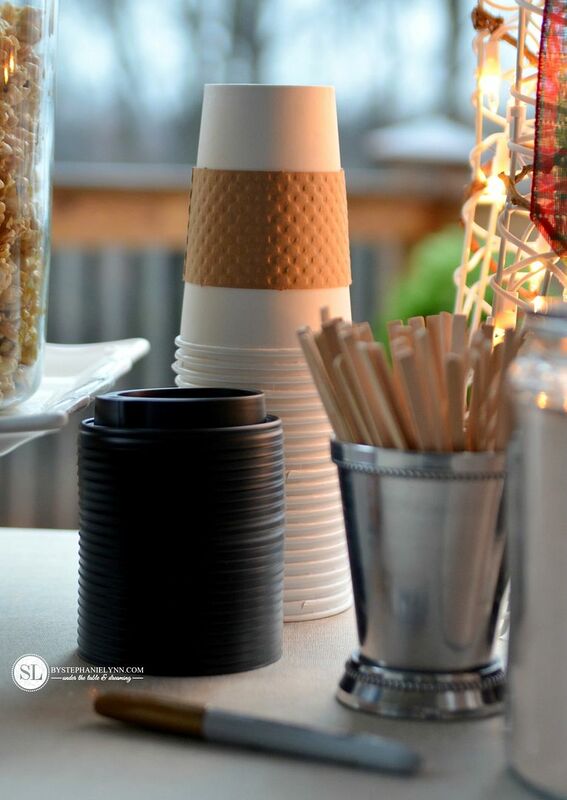 along with the free Hot Chocolate Bar Printables. Line a baking sheet with parchment paper and spray with non-stick cooking spray. Warm the vegetable oil in a large pot, over medium -high heat on the stovetop. Add the popcorn kernels, cover the pot and continually shake gently. Remove the pot from heat when the popping slows or stops. Spray a large glass bowl with non-stick cooking spray and pour the popped kernels into the bowl. Set aside. Add the butter, sugar, salt, and corn syrup to a heavy saucepan and stir over medium heat. Once the mixture begins to boil, reduce the heat and continue to boil for 5 minutes, stirring constantly. Remove the saucepan from the heat and add in the baking soda. Stir until the mixture begins to turns into a 'foamy' consistency. 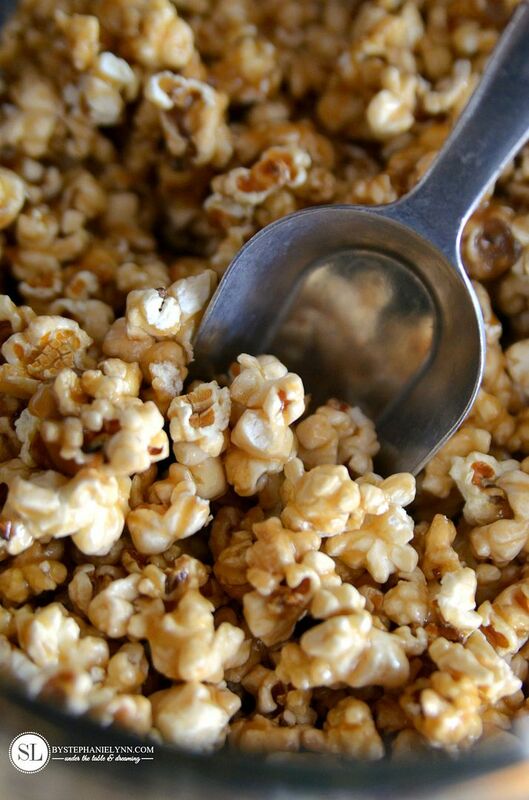 Working quickly, drizzle the popcorn with the caramel sauce, and stir to coat the popcorn. Spread the popcorn evenly on the prepared baking sheet. Bake for 15 minutes. Remove the pan from the oven and gently toss. Bake for another 15 minutes, remove the pan from the oven and allow to cool. Break the popcorn into pieces and store in an air tight container. Warm the vegetable oil in a large pot, over medium -high heat on the stovetop. Add the popcorn kernels, cover the pot and continually shake gently. Remove the pot from heat when the popping slows or stops. Spray a large glass bowl with non-stick cooking spray and pour the popped kernels into the bowl. Add the cashews, toss and set aside. Bake for another 15 minutes, remove the pan from the oven. 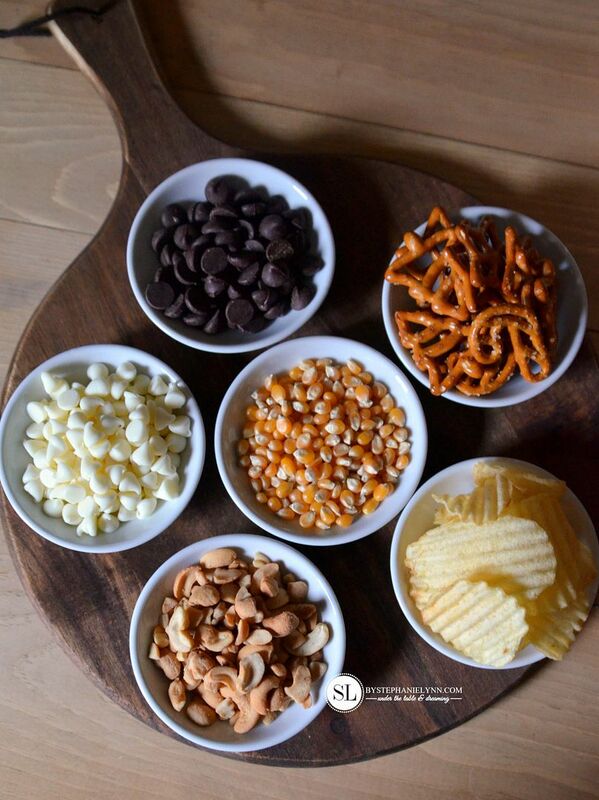 Sprinkle the popcorn with the potato chips and pretzels. Gently toss and allow to cool on the baking sheet. 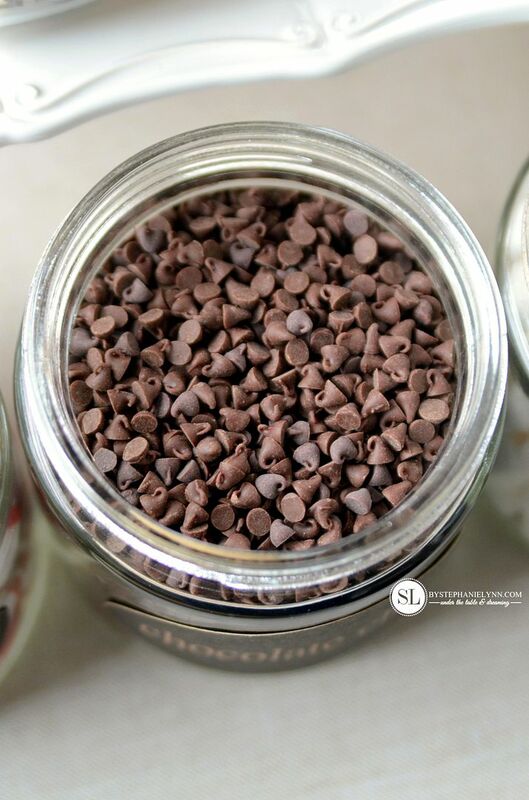 Place the dark chocolate chips in a microwave safe bowl. Microwave on medium, stirring every 30 seconds, until melted. 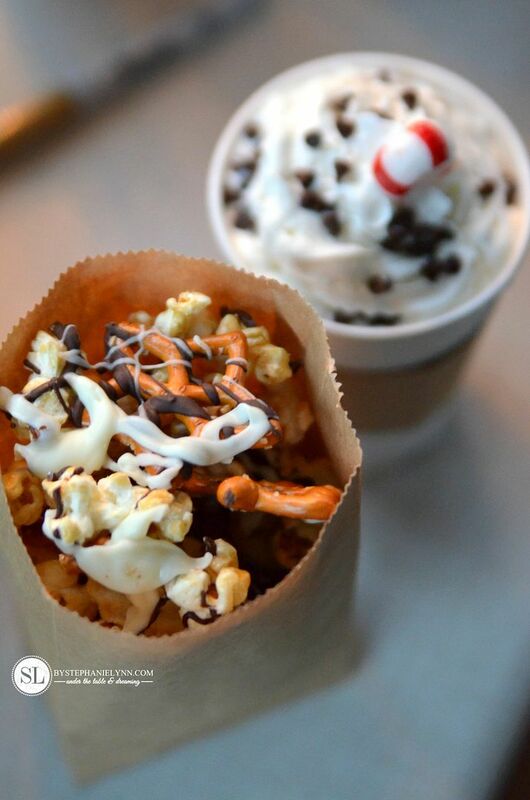 Drizzle the melted chocolate over the popcorn mixture. Place the white chocolate chips in a separate microwave safe bowl. Microwave on medium, stirring every 30 seconds, until melted. 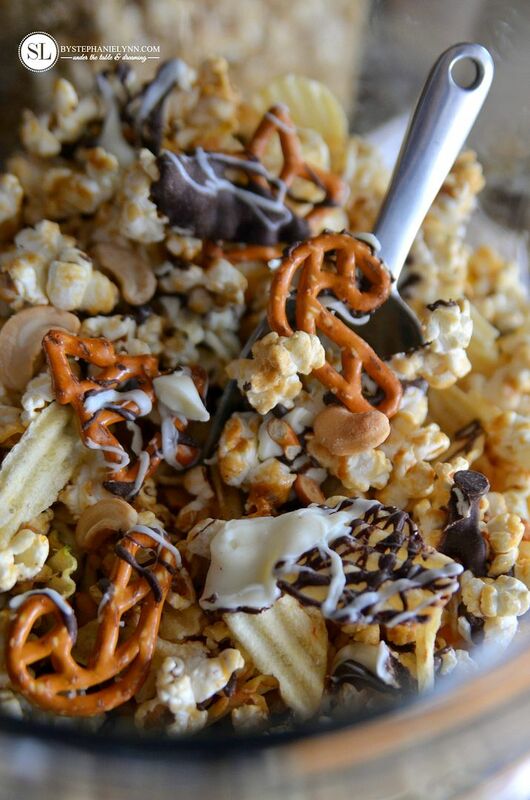 Drizzle the melted chocolate over the popcorn mixture. Remove from the fridge and break the popcorn into pieces. Store in an air tight container. 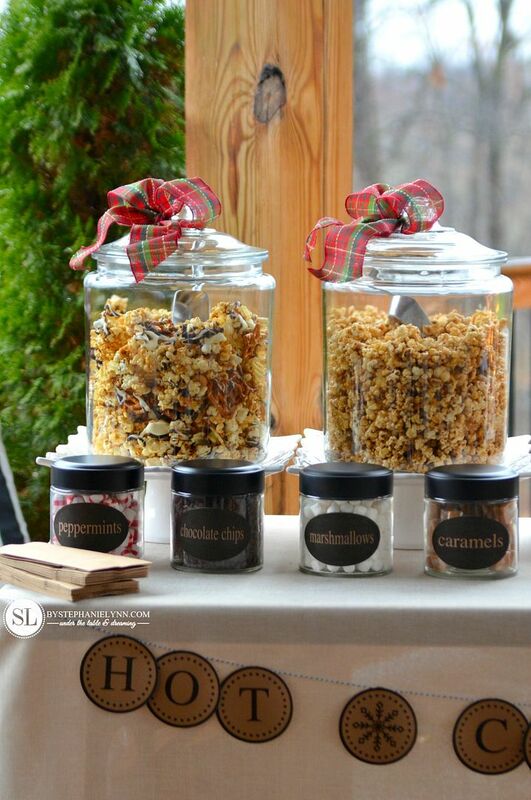 The main ingredients for the homemade popcorn recipes were conveniently picked up right at our local Big Lots, along with the items mentioned above for the hot chocolate bar. 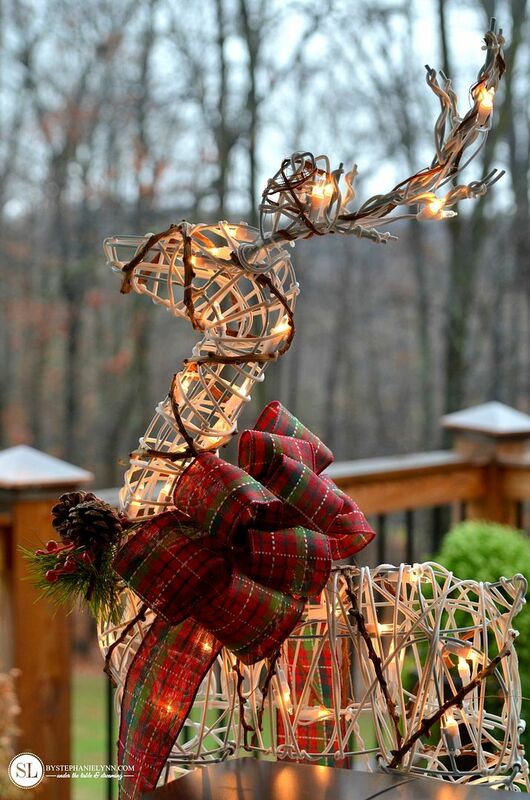 Big Lots offers an array of quality baking ingredients and seasonal decor items – perfect for holiday entertaining. 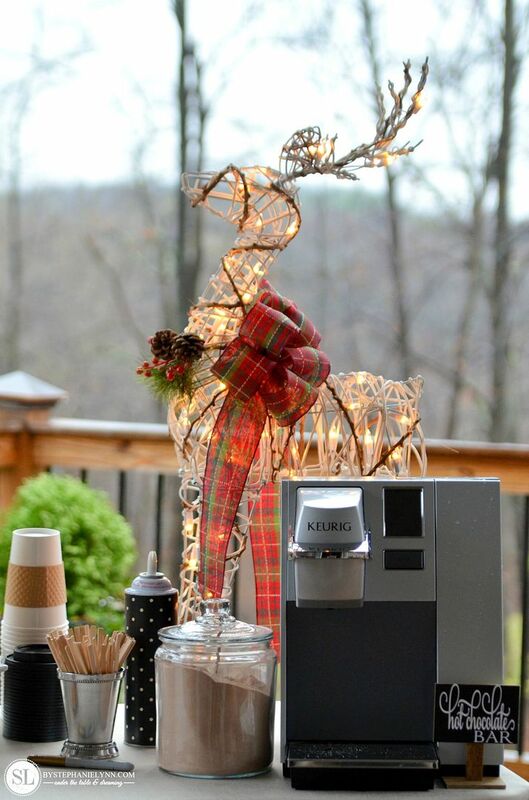 For more inspiration and product information, check out Big Lots on instagram, pinterest, and twitter. Thank you so much Summer! I greatly appreciate it. Happy Holidays! I am always delighted to discover a post by a fellow SoFab member. This is one of the most beautiful shops I have seen. Everything flows perfectly, and your styling and pictures are great. Thank you for the inspiration and Merry Christmas! Your set up is wonderful! Love all the personal touches. Your party decor always looks amazing! You are so creative.